I sit next to it, alone in the dark, the lights from the tree twinkling in the night ... and I cry. The house is all decked out for Christmas, so is the garden. Christmas dinner has been prepared (it's a traditional stew that's so much work most households only serve it at Christmas) and it is safely tucked in the freezer (like most stews, it's even better once it's been frozen, the flavors becoming more mellow). 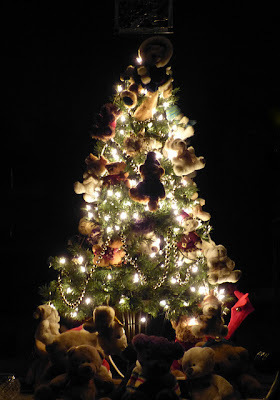 The Christmas tree is decorated with all the teddy bears my mother has given me throughout the many years of my life. I sit next to it, alone in the dark, the lights from the tree twinkling in the night... and I cry. The house is filled with the ghosts of all those I loved and who are no longer here. How sad life's course can be. Where are they now, my dearly loved ones, those whose presence brought such joy to Christmas? If time is not linear, as Einstein intimated, then mustn't they still be here with me? So I turn to my memories. And to jar my mother's memory, I become a story teller. "Remember when you made the traditional pork stew and how Dad would sneak into the kitchen and dip a wooden spoon into the pot for the sheer pleasure of stirring the stew while anticipating the feast? Remember how you would admonish him not to break up the meatballs and to leave it alone? And do you know that I would sneak into the kitchen and add more cloves into the stew? I guess you didn't and nobody ever complained that it was too spicy. Remember how, when we were children, you and Dad would go to New York City with your mother and father at Thanksgiving to do some Christmas shopping? I still remember those funny dolls you brought back for Chris and I... you know those dolls that had elastics on their feet that you could slip over your own so that you could dance with them? Now I dance with you because you've lost your equilibrium and you need help to walk. Oh and how you decorated the house! It was always lovely. And preparations in the kitchen. You would start early in October. Fruit cakes wrapped in cheesecloth dipped in cognac. Dough for doughnuts that you would freeze so that you could fry them just before Christmas. Meat pies, shortbread cookies, yum yum squares and date squares. It was a cooking marathon that would culminate in a table laden with delicious treats. And remember how Chris and I would hunt through the house to find where you had hidden the Christmas presents. She was a champion... no hiding place was ever safe from her. And Christmas Eve... mirrors polished, silverware gleaming, candles lit, tree shimmering, table set... all dressed up in our finest as we headed off to church for midnight Mass. Then we would return home and have the Christmas Eve meal while we emptied the Christmas stockings that had miraculously appeared before our return. Oh what love you put into preparing Christmas." And so I sit in the dark and cry while my mother is confined to her room because she can't manage the stairs anymore. I've gone through the motions of preparing Christmas, but my heart was heavy and it still is. We go through life thinking we are eternal (and we probably are, but not as we imagine it). We spend an inordinate amount of time installing ourselves into life and then, just when we think we've mastered the art, life turns the table on us and we realize the end is near. If we are unfortunate, those we love have already left and we delve into our memories to keep the joy alive. Our caregivers' lifestyle leaves little room for socializing. And then sometimes, our life circumstances make us less than enviable guests to banquets or gatherings to celebrate Christmas. Christmas can be a time filled with wonder and love. And Christmas can be a time filled with longing and tears for merrier Christmases passed. And so this year, Christmas' gift might not be as glittering and shimmering as it once was. But if I discard the tattered gift wrapping and frayed ribbons, I might still find a treasure. The gift of my mother's love for us throughout her life. And the gift of being able to care for her as she once cared for us.